The president of the United States, it appears, was indirectly responsible for a hot air balloon landing on a south-end neighborhood in Pahrump. Selwyn Harris/Pahrump Valley Times A Presidential visit to Las Vegas forced Vegas Balloon Rides Lead Pilot Jonathan Wright to land along the 4600 block of East Paiute Boulevard on Saturday morning April 6. Carrying 12 passengers Wright and his crews launched the hot air balloon from Petrack Park. Selwyn Harris/Pahrump Valley Times Pilot Jonathan Wright makes a perfect landing after flying roughly 12,000 feet above the valley floor for more than 30 minutes. Wright noted that unlike Las Vegas, the Pahrump area has zero restrictions on the altitude of the flights. In Las Vegas, the flight ceiling for hot air balloons is just 1,500 to 2,000 feet above the ground. Selwyn Harris/Pahrump Valley Times Passengers Irene and Michael Pavao from Maui, Hawaii, at first said they were terrified on their maiden hot air balloon flight, but once acclimated, the couple said the flight was "absolutely beautiful.” As Saturday was Irene's 60th birthday, she was gifted with a birthday cake after the flight. 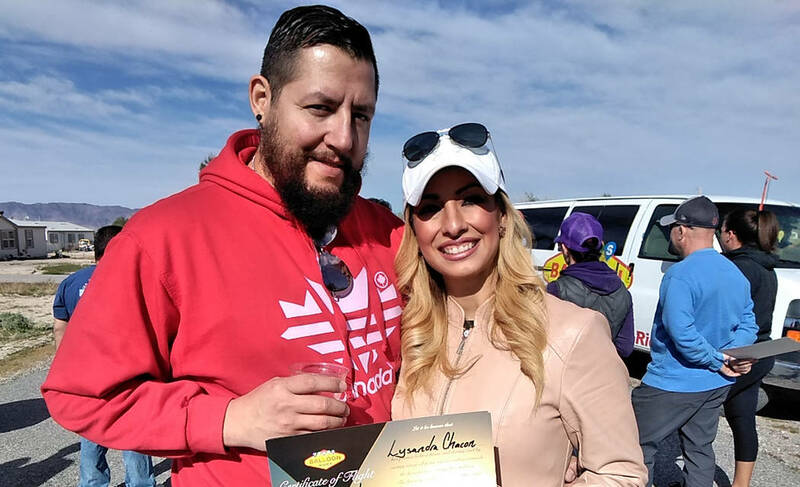 Selwyn Harris/Pahrump Valley Times Visiting Las Vegas from El Paso, Texas, Lysandra Chacon and Will Gomez said their first hot air balloon flight was "An amazing experience." Chacon was celebrating her 38th birthday. 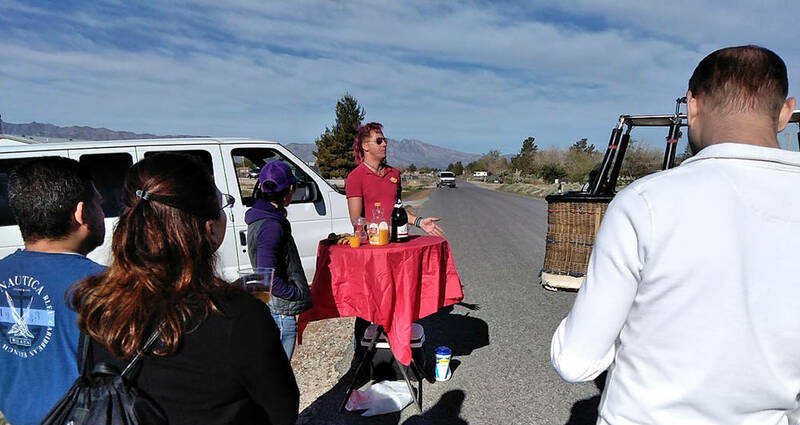 Selwyn Harris/Pahrump Valley Times A Vegas Balloon Rides staff members provides passengers with mimosa cocktails shortly after the landing on Saturday. All 12 passengers also received an official flight certificate to memorialize their respective experiences. Selwyn Harris/Pahrump Valley Times Jonathan Wright, Lead Pilot of Vegas Balloon Rides talked about the history of hot air balloon aviation over the centuries. The first successful hot air balloon flight with a human on board, took place on back on Nov. 21, 1783 in Paris, France. 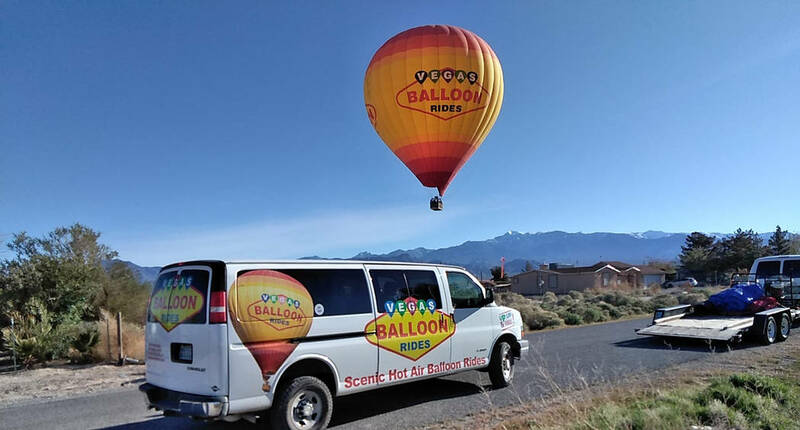 The incident occurred Saturday morning, April 6, when Jonathan Wright, lead pilot of Vegas Balloon Rides, gently touched down along the 4600 block of East Paiute Blvd. just after 8 a.m.
Wright, who was joined by a dozen passengers on the flight, spoke about how the group ended up in the town of Pahrump that morning. As a result of the president’s Southern Nevada visit, Wright said he, his chase crews and the passengers drove to Petrack Park in Pahrump for the launch. He also noted that unlike Las Vegas, Pahrump has no altitude restrictions, which allows for much more visibility while aloft. 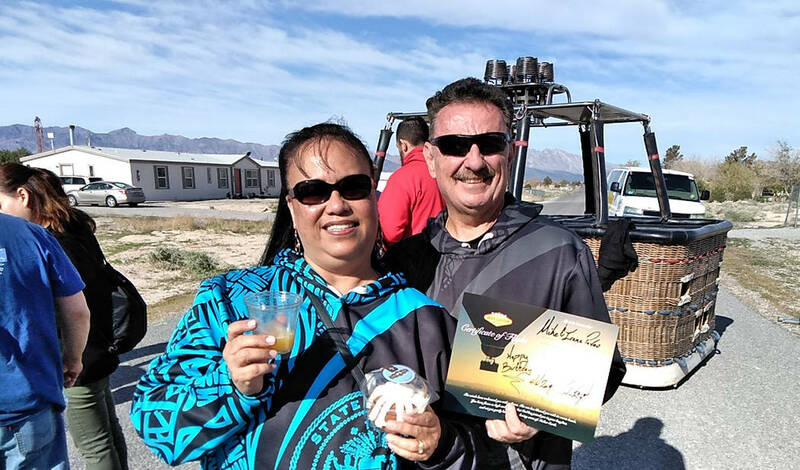 Once back on terra firma, passengers Irene and Michael Pavao from Maui, Hawaii spoke about their first hot air balloon experience on Saturday. Arriving in Las Vegas from El Paso, Texas were Lysandra Chacon and Will Gomez. The couple also spoke about their first-ever hot air balloon flight. Gomez, on the other hand, commented about the residents and the town of Pahrump. Wright, meanwhile, spoke about actually piloting a hot air balloon. Additionally, Wright spoke about his experiences in Pahrump. 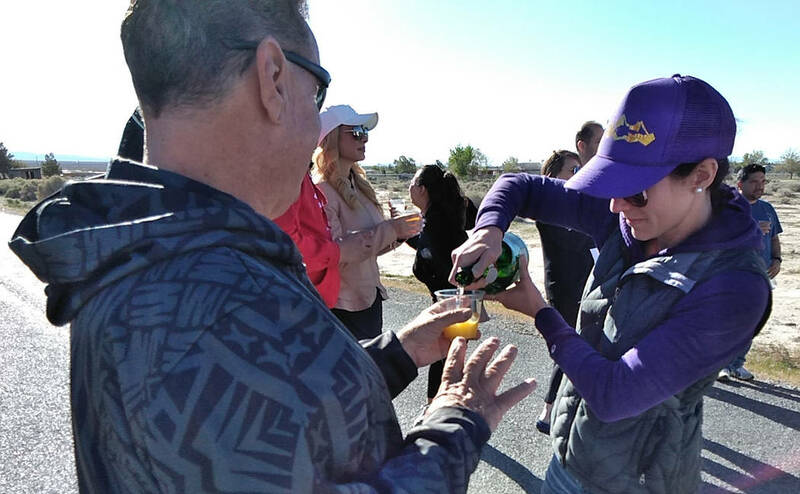 Following the flight, the passengers, who received flight certificates toasted their experience with Mimosas, a mixture of orange juice and champagne. 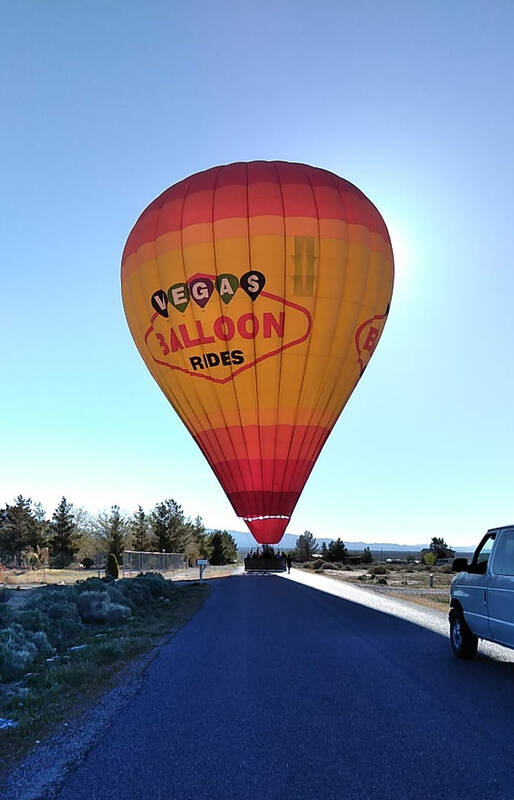 Wright also urged anyone interested in taking a hot air balloon ride, they can learn more information by contacting Vegas Balloon Rides at 702-553-3039.